Eden Hazard to silence Old Trafford, Leicester to draw with Man City and more predictions. Hazard has yet to score in the Premier League this season. DIEGO COSTA IS suspended for the Old Trafford encounter, meaning Chelsea won’t be able to rely on the Spanish international, who claimed a brace against Watford on Saturday. 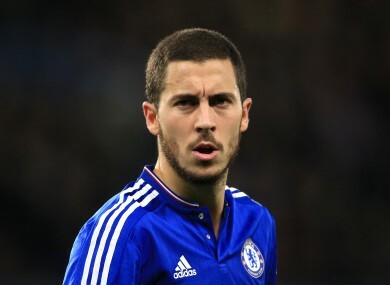 On a more positive note, however, Eden Hazard is expected to come back into the starting XI after making a return from injury off the bench against the Hornets. Last season’s PFA Player of the Year has struggled as Chelsea have flopped this season, and the attacker has yet to score in the Premier League since the campaign began, but with Costa absent, more responsibility will fall on the 24-year-old’s shoulders. However, against a Man United side that looked sapped of confidence against Stoke, and under the tutelage of new manager, Guus Hiddink, Hazard may belatedly start to flourish. Leicester’s unbeaten run finally came to an end yesterday, as they were deservedly beaten 1-0 by Liverpool at Anfield. For once, the Foxes lacked spark, as key men Jamie Vardy and Riyad Mahrez were substituted, while Liverpool’s defence held firm. Against Man City on Tuesday, they face a similarly tough challenge. However, at home, Claudio Ranieri’s side’s performances have been particularly eye-catching of late, while Man City have failed to win any of their last four away matches. Having started the season slowly, there is no question that Harry Kane is now beginning to emulate his remarkable form from last season. 10 goals in his last nine games, including a brace against Norwich on Saturday, indicates the level of confidence with which the England international is currently playing. The same could be said of Spurs, in general, with London club currently in fourth place, two points ahead of fifth-place Crystal Palace. Norwich may have been comprehensively beaten in their St Stephen’s Day encounter with Tottenham, but you get the sense that this match has been the game they were targeting in terms of then having a more realistic chance of earning three points. Wes Hoolahan and Gary O’Neil were both rested for the Spurs match, but both are in line to start at Carrow Road tomorrow. Despite beating Man United earlier this month, the Canaries’ form has invariably been indifferent of late, but expect them to get the better of an Aston Villa side who have failed to pick up three points since the opening day of the season. Romelu Lukaku had a rare quiet day, as Everton grabbed a last-gasp win over Newcastle at St James’ Park the other day. However, notwithstanding his St Stephen’s Day blank, Lukaku has still managed six goals in his last six Premier League games overall. It won’t be easy at home to a Stoke side that have picked up a clean sheet in eight of their last 11 matches, but if anyone can do it, the prolific Belgian international surely will. Email “5 Premier League bets to consider ahead of the upcoming action”. Feedback on “5 Premier League bets to consider ahead of the upcoming action”.